Usually, when a dog acts afraid there is a reason. Dogs learn by association – positive and negative. The more positive experiences a dog has, the better their behavior. Since your dog cannot discuss their issues, you are left to guess what is causing him or her to react the way they do. It’s a hit or miss kind of game. By process of elimination, usually you will find the root cause of that particular unacceptable behavior. Dog owners can buy both standard care and emergency care veterinary insurance policies for their pets. If your dog is afraid of your vet, take steps to fix that situation. 1. The vet does not positively interact with the dogâ€¦they come in, they “hurt” them and they leave. 2. The dog terrifies the vet. The dog senses it, and takes the upper hand. There are vets, who are petrified by some dogs. That’s why they have assistants! 3. The dog for some reason known only to them, does not feel safe or comfortable with that particular vet. Trust your dog’s instincts. Many dogs are great judges of a person’s character. If your dog does not like someone, listen to him or her. 4. Something extremely traumatic happened during a previous vet visit. Shelter dogs in particular, have often have negative vet experiences. To help your dog get over the stress of visiting the vet, you have to help them modify that negative association, by making vet visits a pleasurable experience. It is more often than not, one of the easiest behavior issues to change. The cause is a mystery, but the issue is obvious. Your dog needs to associate the vet with something positive. 1. Find a new vet. If your vet does not positively interact with your dog before and after a procedure, they don’t deserve your hard earned money. 2. If your vet is afraid of your dog, find a new vet. Your dog senses that fear. A dog should never have the upper hand. The relationship must be based on mutual trust and respect. *Take a ride to the vet, just walk around the parking lot. Give your dog some yummy treats. Praise your dog for being such a “good boy or girl.” Get back into the car and go home. Do this a few times. When you see your dog is comfortable at this stage, it’s time to move on to the next. *Next, take a ride to the vet. This time, after walking your dog around a bit, go inside. Give your dogs lots of yummy treats. Ask the staff, and the vet; to interact with your dog, and to give your dog treats. Make the experience a positive one. Lots of attention, lots of fun, lots of treats and lots of praise. Get back in the car and go home. Repeat this as necessary. You will know when your dog is responding positively, when they are no longer tense, simply walking into the office. *Finally, make an appointment with your vet. 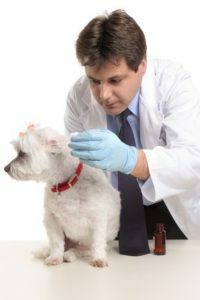 Have your dog go into an exam room for nothing more than a basic check-up. No shots! Nothing invasive. Make it a positive experience. Lots of focus on your dog, lots of treats and lots of praise. It’s worth the price of a visit, to help him or her overcome their fear.